Sister Kathleen is overwhelmed with gratitude for the relationships and experiences she has been blessed with, as she welcomes 2017, her Year of Jubilee. After graduating from St. Mary’s Academy, Portland, she found herself trying to make a decision whether to enter the Providence or the Holy Names Community, as her passion was working in a hospital setting as well as in education. Following her beloved aunt, Sister Frances Jacobs, Kathleen chose to enter the Sisters of the Holy Names. She began as a first grade teacher, influencing children, teachers and families to develop a love of learning and the beauty of life through reading, writing and the arts. Discovering beauty was a gift she received from her mother who decorated their home with flowers and welcomed all with open arms. 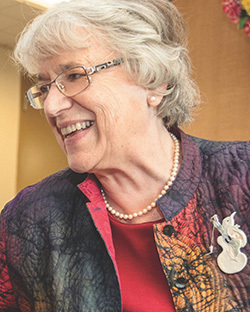 Teaching every student at their own unique level, acknowledging their best qualities, then building an individualized learning plan to meet each child’s needs is Kathleen’s legacy as an outstanding educator. She saw the life-long benefits of her teaching style and dreamed of leading a school with like-minded teachers. Earning an administration degree, she was principal of St. Paul School in Eugene for 12 years. Kathleen’s father shared his leadership wisdom with her: “Remember to gather people with different skills than you; your job is to facilitate those who you gather to create together something great.” She took this lesson with her and applied in whatever she did. After 20 years of teaching, she joined the Oregon Province Leadership Team, offering her creative vision to help bring the dream of Mary’s Woods at Marylhurst to reality. Her Nursing Home Administration Certificate, along with compassion for the elderly, enabled her to make Mary’s Woods resident friendly and artistically designed. With a continuing concern for the elderly, she implemented the “No One Dies Alone Program” in the Portland area. Noticing that some families needed help in planning memorials for their loved ones, she became a Certified Celebrant helping families to plan memorials and presiding at funerals and weddings. Presently, Kathleen continues to care for the elderly at Portland’s Laurelhurst Village, formerly Mt. St. Joseph. Kathleen’s life journey has been truly a gift. She is deeply thankful for the many enriching opportunities and wonderful people she has met along the way to share her love of life and caring spirit with!